Lukasz Nenko is a 36 years old hobby photographer, husband to a lovely wife, and a father of an adorable 2 years old son. Q1. Who is Łukasz Nenko? Tell us a little about you are and your photography? I’ve been doing analogue photography for nearly 15 years. First attempts were made in the early 90’ with a Zenit that belong to my father. But the results were poor, and the developing of color film was expensive. Later on I’ve started to use digital but got totally bored with hundreds of photos after each trip in the mountains or from any other party. So at the highest point where digital was nearing itself to kill analog, I’ve started do use BW film. Since then I’m doing nearly 99% of all photos with analog cameras. I love the whole process from taking photos until the ready print is drying. I’m not a master printer, and probably will never achieve those skills, but I’m still learning and hopefully I’m going in the right direction. The starting point of my analogue journey difficult because everyone wanted to do only digital ‒ and it was pretty hard to gather information or chemicals. So I was buying my equipment in Germany and USA as the market there is well supplied. Through all these years I’ve explored thru street photography, alternative processes as wet plate etc, thru journeys into wild Romanian mountains, Ukraine, Morocco etc. Q2. Is there anyone or anything that inspires your photography? At this point of my life I like to take portraits and shoot the surrounding wilderness early in the morning. So every weekend I’m getting up around 4.30 - 5:00 AM, take three bags of equipment (35mm medium and large format) and go to catch the first light. And it’s not important if it rains or its -20C. Nearly everything can be a inspiration ‒ the light, the pose, a book everything. Only when I’m doing portraits I have to see “something” in the eyes. I’m not working with professional photo models ‒ I prefer “normal people”. That was wonderful in Romania ‒ the simplicity of the life, really great people, and their faces that were covered with layers of hard life. Q3. Can you tell us more about this? The event that you mentioned was a meeting with young photographers (mostly with no experience in analogue). 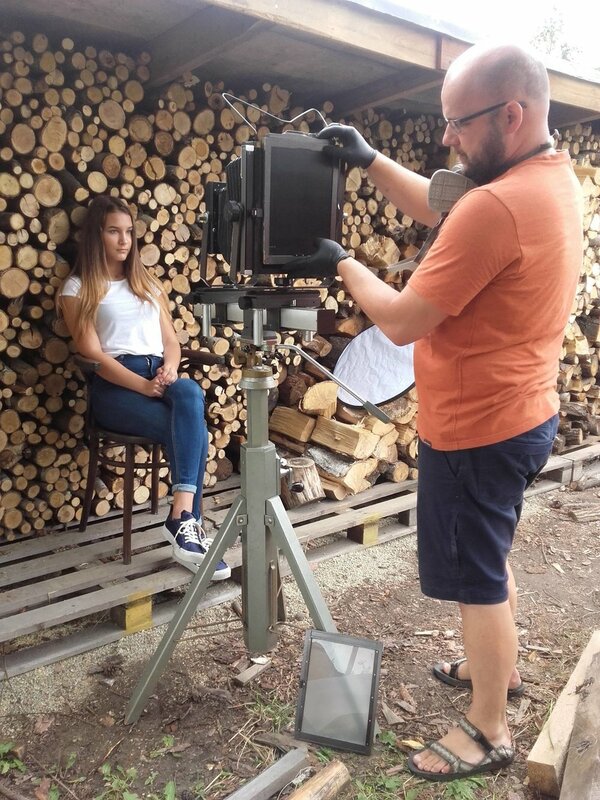 It took place in Katowice in “photographer’s coffee”. I was supposed to talk about the basic information in about 1.5h ‒ and we ended after 4h. The people were really into it. And you can imagine what can a youngster feels if he has a DSRL and sees for the first time a 18x24 cm negative and the camera. Q4. 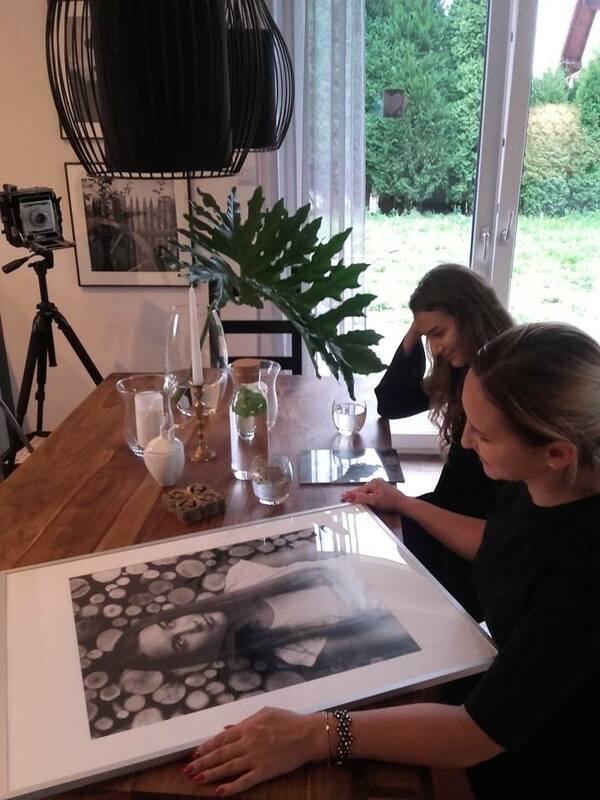 Tell us about this massive print and the print with the two women. ﻿Large Prints: I’m trying to make always large print’s it’s pretty difficult to sell them but the end effect is remarkable. Blowup’s from 4x5 have such great quality its simply fantastic. I had to make my own developing tank’s to develop them but it was worth it. They are from ESG 6mm gals and are 1.5m long ‒ It takes ca 5L of chemistry for each step. The photo paper that i use for my daily work is the German TETENAL (Vario); it gives me the best contrast, and really great blacks. For the biggest prints I use a FOMA - it has a really great white base, and it's easy to get in Poland. Regarding the two ladies. The younger one is Michaline she’s a singer (she was in “the voice of Poland”) and the other one is her mother. I’ve made some photos of Michiana ‒ you can see them also on my website www.fotografiaszlachetna.pl. The print I also a blowup from a 4x5 neg. I’ve made several more print from medium format for them around 60x60cm. Q5. What project are you currently working on? 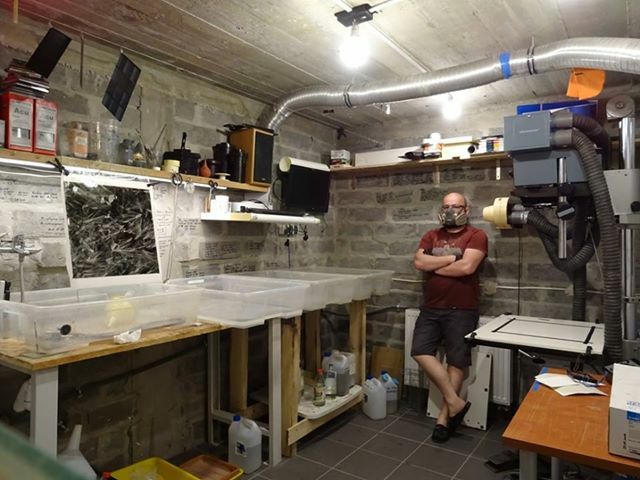 My newest project is to use a large negative (50x60 cm that was used in the 90s for newspaper printing) and I want do build the proper camera for that. At the moment I’m testing those materials (developing and printing). Q6. If you visit Japan, what would you photograph? I wish that one day I could visit Japan. I think that I would shoot a combination of street photography (I always wanted to see the fish market) and portraits. I would love to find older people in the countryside and take some pictures of them ‒ just I’ve done it in Romania. Who knows, perhaps find some clients in Japan - for printing blowups or portrait’s. An important point would be to visit some stores with film cameras (we see often in European photos of such places) ‒ and you can’t find those in Poland. And the technical aspects. Q7. What kind of equipment do you use? loud enough to overcome the cooling fans and air-conditioning that runs over the wet table. I’m able to make 1,5x3m prints but there is a problem with getting such photo paper. Thank you, Lucasz for your time, and we hope our readers will see some exciting stuff coming from your work! Hope to see you in Japan! 9:00 AM: Meet at JR Musashisakai Station (Chuo Line)- South Exit. 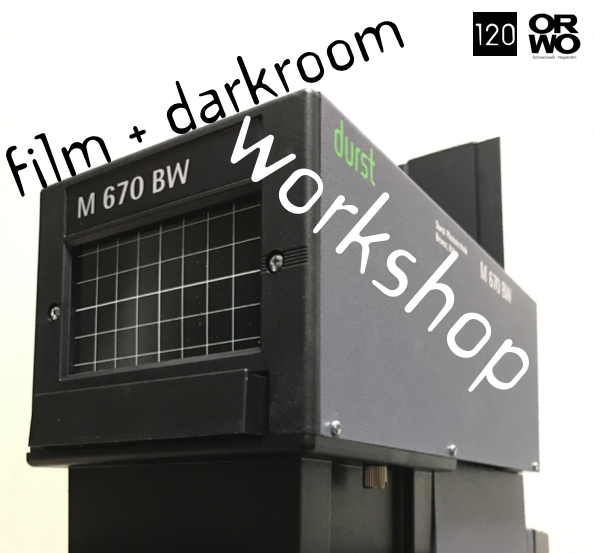 From there, participants will be driven to the workshop darkroom. 10:00 AM: Shoot one roll of film using ORWO N 74 plus 35mm black and white film. Cameras and film will be prepared for participants. If you have a light meter or light meter app on your smartphone, that will be helpful. If you wish to use your own 35mm film camera,that’s also possible. 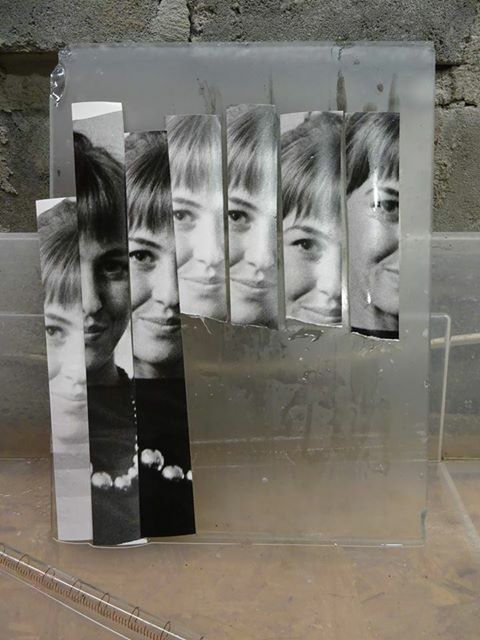 11:00 AM: Participants will be guided to process their own black and white film. Print final images. Participants will be provided with RC photo paper. 120 LOVE is very proud to announce our newest member to the family, Lyon-based photographer, Ksenia Vysotskaya. From the beginning of 120 LOVE's journey, it has been our goal to preserve and maintain the beauty and relevance of medium format film photography in the digital era via our message and the photographers we work with. 120 LOVE is delighted to have Ksenia on our squad, and we hope our supporters will gain inspiration from her work. Q1: Tell us a bit about yourself and how the did the camera become part of your life? My photography journey started when I was 17, just before moving from Russia to France. But the decision to devote myself entirely to photography was not easy. In 2016, I graduated with a Master’s degree in Law and, after careful consideration, I realized that what I really want in my heart of hearts is to live an authentic life and experience it in all its fullness. Photography is my way to achieve this goal. I am passionate about documentary photography because of its capacity to communicate about the world in both subtle and direct ways. A Magnum photographer Matt Black said “We are not photographers – we are no longer technicians with a camera – but we are authors. Our role is to tell stories by not merely illustrating but creating.” I think he is right. I like how I feel when I am working on a documentary project. My camera is a kind of pretext for looking for an interesting subject to explore, going out, connecting with others, and being mindful. Q3. Out of all of the projects you have done, which project are you most proud of? Well for the moment I am not really proud of my work. I realized some interesting projects, but I am still on my learning way. We shall debate this in a few years ! Q4: Can you tell us some about the project you are currently working on? I am currently working up on a major documentary project about Lake Baïkal. The world's largest reserve of fresh water is now facing one of the most serious ecological crises in its 25 million years’ history. In fact, a large part of the lake is raided by the Spirogyra algae which causes disappearance of native aquatic plants and fish. That poses a serious threat to existence of the lake and surrounding ecosystem. The project won’t be a pure photography work, but an investigation about those who are responsible for this disaster and the impact of the change on everyday life of local populations. For now I am looking for partners and fundings. The project should start by the end of 2018. Q5: What kind of feedback have you received from your peers or from people that have viewed your work? Is there anything you want to redo or reshoot? In October 2017 I went to Georgia in order to document everyday life of shepherds in the Tusheti region who still practice transhumance. I could not accomplish the project because of bad road conditions, but I will definitely come back and pick the project up! Q6: Who or what influences your photography? My visual education mostly comes from cinema and modern painting. Ulrich Seidl, Wes Anderson, Wong Kar Wai, David Hockney, Niko Pirosmani, Egon Schiele...the list goes on! As I never received any photography or fine arts education, I spent a lot time monitoring and studying the work of other contemporary photographers and artists. Some of my favorite references : Hanna Lenz, Bryan Schutmaat, Viktoria Sorochinski. Also, I am very lucky to know Guillaume Ducreux, a 120 LOVE french photographier who is like a guru for me and who always pushing me to go forward in my photography practice; especially to improve my developing, printing and scanning skills. Q7: On your website, there aren’t any black and white pieces. Is it because you prefer color more or you just haven’t uploaded any? I express myself with color. However, I do some black and white photography for some special commissions and also when I wish to develop the films by myself. Q8: What lies ahead for your in the future? What would you like to accomplish in the short term and long term? For 2018, I set a goal to start two long-term documentary projects, as well as achieve some qualitative commercial assignments (yeah, I do and love commercial work). But my main intention remains to grow up as a photographer and a human. Q9: A number of our readers and supporters are keen on the technical aspects of film photography. Can you provide some details as to your equipment and your workflow? I use a medium format film camera (Pentax 645) with a 75mm f/2.8 lens, but it’s constantly evolving ! I would like to test large format soon, as well as some new types of film (Washi, CineStill film...). 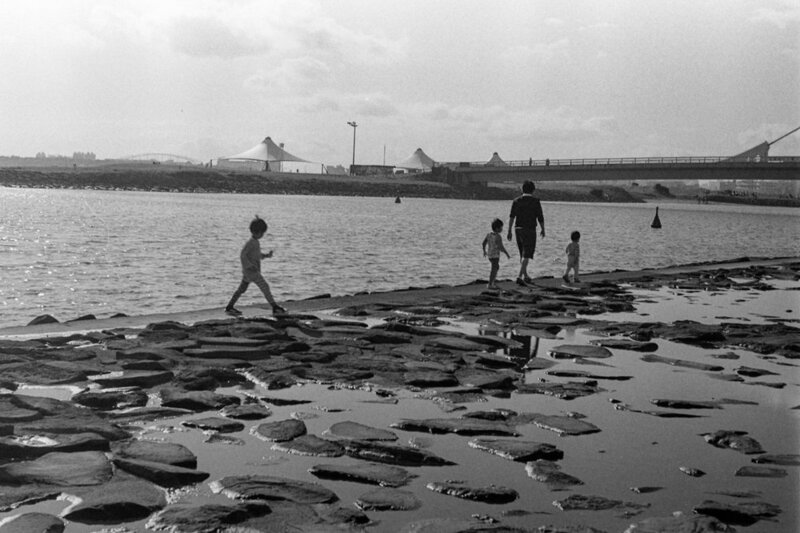 Film photography is a world apart, a fascinating univers with lots of options. That’s what I love about it. Thank you, Ksenia and welcome to 120 LOVE! 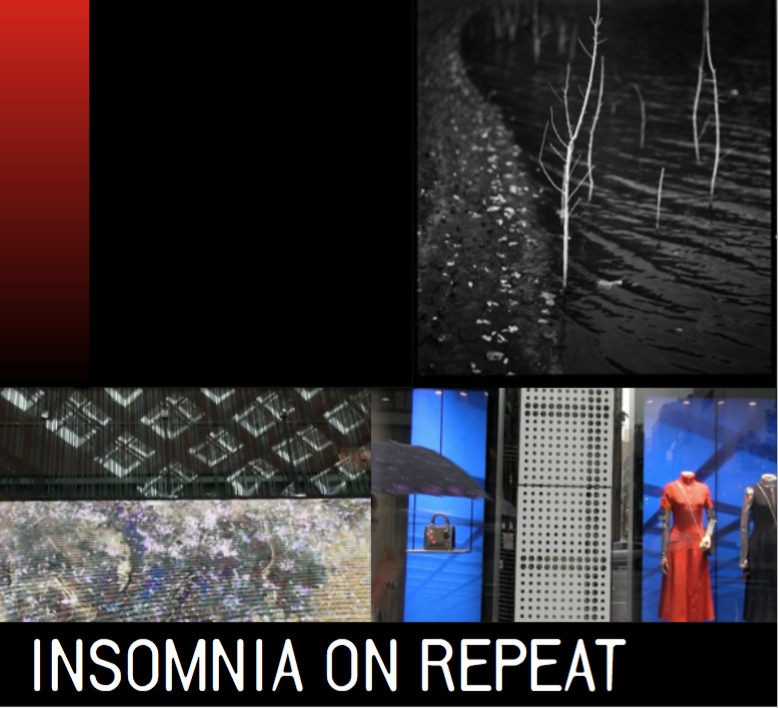 A primer for our upcoming event in Tokyo, "Insomnia on Repeat," Marty Mora interviews one of 120 LOVE's very own squad members, Guillaume Ducreux. Marty (M) Hello Guillaume, thank you for your time for this interview. Guillaume (G) No worries, thank you for interviewing me. (M) Have you ever been to Japan before? (G) No, this is my first time to come. I am excited to come as Japanese culture has intrigued me since I was young. (M) What part of Japanese culture do you like the best? (G) It is hard to decide only one part...when I think of Japan I think about calligraphy, tattooing, mythical creatures and printmaking. For me, art seems to be inseparable and deeply rooted in Japan, and this fascinates me. (M) I totally agree with that, they are one in the same! Speaking of art, when did you start with photography? (G) I started in 2008. I began to live in Lyon at that time, and when I was young I was not interested in traditional sports. Rather at this time extreme sports were coming to Europe, as well as the culture that is associated with it, like music, graphic design, video and of course, photography. This subculture really facinated me. I began to take pictures of the events around me, as well as of family and friends. Photography commsumed me and capturing the personal moments of people lead me down the path I am on today. (M) Do you have a favorite camera? A favorite film? (G) I have two favorites, my Pentax 67 and Leica M7. My workhorse is the Pentax and I love the way it handles, especially with the grips! I spend the most time with it. My M7 is like a diary of sorts. I never am without it, but I much prefer the 6x7 film ratio that the Pentax give me. For film I use Fomapan 400. After trying a lot of different films I like this one the best. It has great character. Fuji is my go to for color film, but now I am worried because Fuji is pulling out of the film market. (M) What would you like your Japanese audience to know about you and your photos? (G) That is a complicated question! My vision of photography is visceral. I say to the students that I teach that you must act before thinking. I consider my photography as a work in process, and lately after coming back from New York I have not produced anything new. The downtime is important and taking a small break from your photos allows you to step away and see them in a different light, which can lead to new ideas. My show on the 23rd, NUIT BLANCHE is my personal work and I am excited to show it in Japan! (M) We are all looking forward to seeing NUIT BLANCHE! You will be meeting and talking with Osamu Kanemura at this event, are you excited to meet him? (G) Yes, I am! I am honored to be doing this event with him and to be given the chance to meet him! I am looking forward to sharing new ideas with him! (M) It is going to be really cool to have the two of you meet on the 23rd! Lastly is there anything else that you would like to say? (G) Yes, I want to thank 120LOVE and Paul del Rosario for this wonderful chance! His energy, passion and kindness is very rare in photography! I am also really looking forward to engaging with new people and meeting Kanemura! (M) Thank you very much Guillaume, see you on the 23rd! 18:00 Guillaume Ducreux talk about "Nuit Blanche"
Marty Mora speaks with up-and-coming Japanese photographer, Ryota Sekiya about his first exhibition, "Silent Lie." マーティ（M） 簡単な自己紹介をお願いします。Marty (M) Can you tell us a little about yourself please? 関谷竜太（R） 茨城県出身、現在白鴎大学教育学部3年、Zero Sum Clubに所属している関谷竜太です。よろしくお願いします。Ryota Sekiya (R) My name is Ryota Sekiya. I am from Ibaraki Prefecture, and am a third year student at Hakuo University in Japan. I am a member of the university's photography club, Zero Sum Club. M　よろしくお願いします。カメラ生活はいつから始めましたか。Thank you! When did you begin taking pictures? R　カメラは、今年の4月から始めました。I started this April. M　それはすごいですね！ちなみに使っているカメラは何ですか。That is quite impressive! What camera do you use currently? M　フィルムカメラ、フィルムは何が入っていますか。Nice Choice！That is a good camera! What film do you prefer? R　オルヴォN74 plusです。ORWO N74 plus. M　それはいいフィルムですよ！フィルムカメラとORWO N74、なぜその組み合わせをしましたか？A great film! A film camera, loaded with ORWO N74. Why did you choose this combination? R　白黒フィルムで、シャープな見た目ではなく、粗い見た目に惹かれて、ORWO N74を使いました。とても味があるいいフィルムだと思います。自分が撮りたい廃墟と、白黒のフィルムが合っていると感じたからです。When you look at it, black and white film is not super sharp; rather it has a rough feeling to it. That is why I chose it. It has a wonderful depth to it. When I am taking picture of ruins I feel black and white film matches what I am taking. M　なるほど。これから予定している展示会「Silent Lie」について少し教えてください。I see. Can you tell us about your upcoming exhibition, "Silent Lie?" R　テーマは廃墟です。私はもともと廃墟が好きで、写真を撮り始めて、絶対に廃墟を撮影すると決めていました。撮影で初めて訪れた時、誰もいない静かで、時間が止まった空間がそこにはありました。そこで今までの人生を思い出して、私の人生にはたくさん嘘があると思いました。自分だけの静かな世界で自分しか知らない嘘がある。そんな思いに浸ることのできる場所が私にとって廃墟だったので、このシリーズのなまえをSilent Lie にしました。The theme is abandoned ruins. I really like them, and when I began taking pictures, I knew right away that that is what I wanted to take pictures of. The first time I went to take pictures of ruins, I was by myself, and I remember feeling like time had stopped. Even now when I remember this, it seems that my life is composed of lies. In my silent world, I can see the my lies that only I know. In these ruins I can give my self over to these thoughts and thus the name "Silent Lie." M　深いですね…「Silent Lie」の使ったフィルムは「N74plus」ですよね。That is pretty deep...Did you use N74 plus for this project? M　今年の４月にカメラをスタートして、まもなく初展示会があります。あなたの写真の才能が認められています。それはどう思いますか。Having only started this April, to having your first solo show...your talent is apparent! I know that other people also feel the same way. How does that make you feel? R　素直に嬉しく思います。好きなものを自由に撮っているだけなので、ここで終わらず、更に技術を上げて、良い写真を撮れたらと思います。I am humbled to hear that since I am only talking pictures of the things that I like. I want to continue to improve my skills and take good pictures. M　「Silent Lie」の展示会、おめでとうございます！これからあなたの将来を楽しみにしています！Congratulations on your first show! I am looking forward to following your progress! R　ありがとうございます！Thank you very much! ORWO was once the second largest film manufacturer in the world offering a wide range of photographic and audio products. The progenitor of AGFA Wolfen, ORWO has had a turbulent history and faced many challenges since German reunification. Today, Filmotec GmbH continues to produce a reduced range of ORWO’s high-quality 16mm and 35mm black and white film products at the original Wolfen plant in Germany. We are big fans of ORWO’s legendary film and eagerly waiting for the return of their medium-format film stocks. Until then, we are proud to announce our dedication to supporting ORWO / Filmotec GmbH and distribute their 35mm black and white photography film products, UN 54 (ISO 100), and N 74 (ISO 400); available in bulk 30.5m / 100 ft cans.